The small inner moons of Saturn look like giant ravioli and spaetzle. Their spectacular shape has been revealed by the Cassini spacecraft. For the first time, researchers of the University of Bern (Switzerland) show how these moons were formed. The peculiar shapes are a natural outcome of merging collisions among similar-sized little moons as computer simulations demonstrate. When Martin Rubin, astrophysicist at the University of Bern, saw the images of Saturn’s moons Pan and Atlas on the internet, he was puzzled. 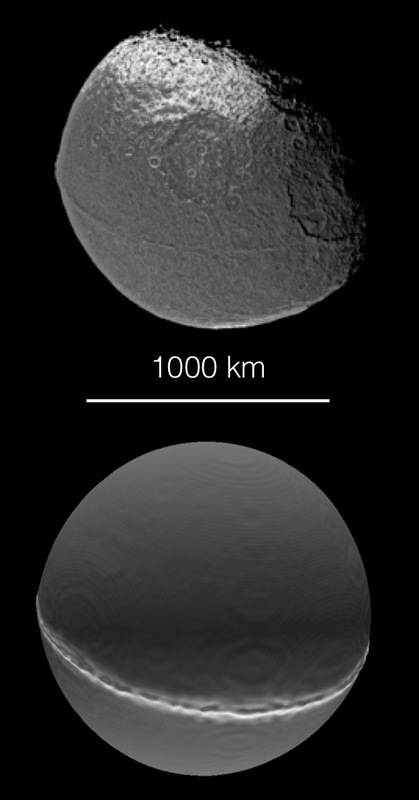 The close-ups taken by the Cassini spacecraft in April 2017 showed objects that NASA described in its news release as flying-saucers with diameters of about 30 km. With their large ridges and bulbous centres, Pan and Atlas also resembled giant ravioli. Martin Rubin wondered how these peculiar objects had formed and asked his colleague Martin Jutzi whether they could be the outcome of collisions, similar to the one that formed comet Chury as Jutzi had demonstrated earlier with computer simulations. 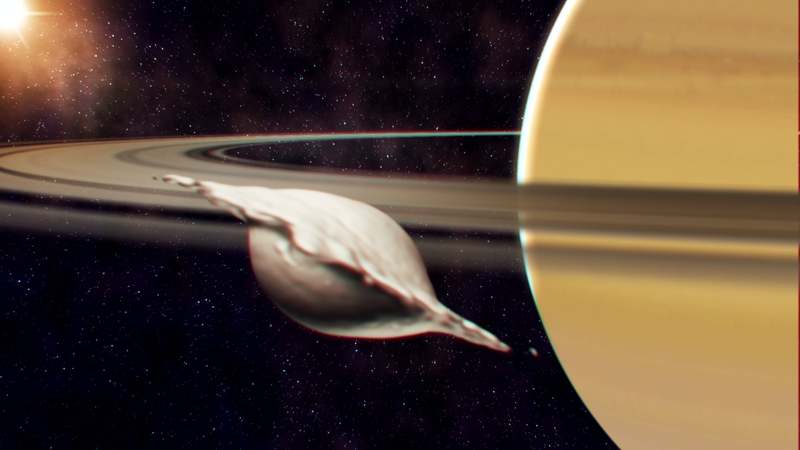 Martin Jutzi and Adrien Leleu, both members of the NCCR PlanetS, took the challenge of calculating the formation process of the small inner moons of Saturn. The first, simple tests worked well. “But then, we took the tidal forces into consideration and the problems piled up,” remembers Adrien Leleu. “The conditions close to Saturn are very special,” confirms Martin Jutzi. Since Saturn has 95 times more mass than Earth and the inner moons orbit the planet at a distance of less than half the distance between Earth and Moon, the tides are enormous and pull almost everything apart. Therefore, Saturn’s inner moons couldn’t have formed with these peculiar shapes by gradual accretion of material around a single core. An alternative model called pyramidal regime suggests that these moons were formed by a series of mergers of similar sized little moonlets. Having solved their initial problems, the researchers could verify the pyramidal regime, but even more: They showed that the collisions of the moonlets resulted in exactly the shapes imaged by Cassini. Close to head-on mergers lead to flattened objects with large equatorial ridges, as observed on Atlas and Pan. 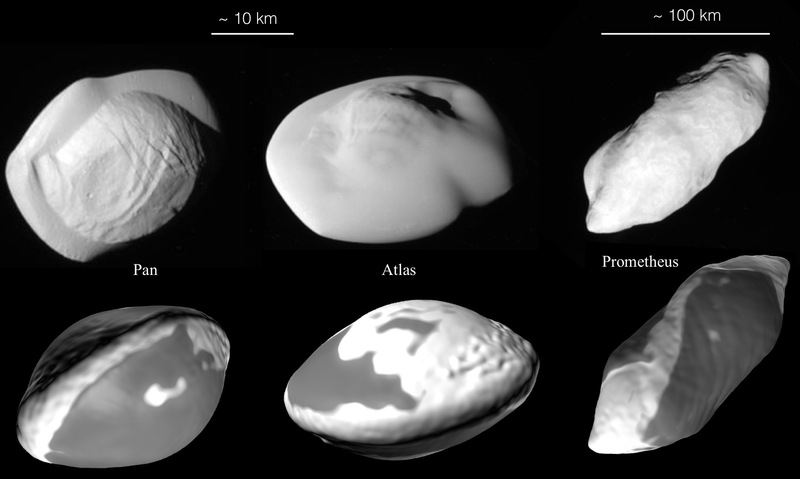 With slightly more oblique impact angles, collisions resulted in elongated spaetzle-like shapes that closely resembled the 90-km long moon Prometheus as it was photographed by Cassini. Based on the current orbit of the moons and their orbital environment, the researchers were able to estimate that the impact velocities were of the order of a few 10 m/s. Simulating collisions in this range for various impact angles, they obtained various stable shapes similar to ravioli and spaetzle, but only for low impact angles. “If the impact angle is bigger than ten degrees, the resulting shapes are not stable anymore,” says Adrien Leleu. Any duck-shaped object like comet Chury would fall apart because of Saturn’s tides. “That is why Saturn’s small moons look very different to comets that often have bilobed shapes,” explains Martin Jutzi. Interestingly, the head-on collisions are not as rare as one might think. The small inner moons are believed to originate from Saturn’s rings, a thin disk located in the planet’s equatorial plane. Since Saturn isn’t a perfect sphere but rather oblate, it makes it hard for any object to leave this narrow plane. So, near head-on collisions are frequent and the impact angle tends to get even lower in subsequent encounters. “A significant fraction of such merging collisions take place either at the first encounter or after 1-2 hit-and-run events,” the authors summarize in their paper published today in “Nature Astronomy”. “In this respect, Saturn is almost a toy system to study these processes,” says Martin Rubin. Although the researchers mainly focussed on the small inner moons of Saturn, they also found a possible explanation for a long-standing mystery concerning Saturn’s third largest moon named Iapetus. Why does Iapetus have an oblate shape and a distinctive equatorial ridge? “Our modelling results suggest that these features may be a result of a merger of similar-sized moons taking place with a close to head-on impact angle, similar to the smaller moons,” the researchers summarize. Reference: A. Leleu, M. Jutzi, M. Rubin: The peculiar shapes of Saturn’s small inner moons as evidence of mergers of similar-sized moonlets, Nature Astronomy, 21 May 2018. doi: 10.1038/s41550-018-0471-7.